Some of the evidence on the clinical effect of black cohosh for menopause is impressive. In one study, sixty women under forty years of age who had undergone hysterectomy were divided into groups. One group got conjugated estrogen (available in the United States under the brand name Premarin), one was given estriol (another form of estrogen), a third received an estrogen-gestagen sequence, and the fourth group of women took a black cohosh extract. Bothersome symptoms such as hot flashes disappeared slowly over the course of four weeks, and at that point there was no difference in response among the four groups. This suggests that black cohosh may be as good at treating symptoms of menopause as are conventional estrogen treatments. Beginning research indicates that black cohosh can also lower cholesterol and strengthen bone, as estrogen does. Black cohosh was a key ingredient in an immensely popular patent medicine, Lydia E. Pinkham’s Vegetable Compound. Black cohosh has been used for menopausal symptoms in recent years. The portion of the plant used is underground: the rhizome and roots. The main ingredients are triterpene glycosides, especially actein, related compounds, and cimigoside. 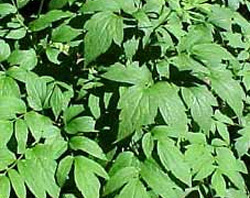 Black cohosh also contains tannins, fatty acids, and phytosterols. In a laboratory test of estrogenic activity, black cohosh extract did not bind to estrogen receptors. Special Precautions : Although black cohosh is not mutagenic or carcinogenic and does not cause birth defects in animals, authorities caution pregnant women not to use it. There is a report of premature birth associated with the herb and worries that it could trigger miscarriage. How about you? Do you have experience using black cohosh for menopausal relief… or know someone who has? Share your experience in the comments below. We’d love to know what you think!